An accessible history of the Bible, enlivened by a commitment to open Jewish-Christian relations. As Pelikan, a leading historian of Christianity, has done with sacred figures (Jesus Through the Centuries, 1985; Mary Through the Centuries, 1996), so he now treats sacred text. In this short, highly readable volume, he traces the history of the Bible, and of Bible-readers, from antiquity to the present. The chronology is familiar. We read about the translation of the Greek Septuagint and the Latin Vulgate, and the creation of the New Testament. We travel through the Enlightenment, dipping into Albert Schweitzer’s scholarly approach to Scripture, and Milton and Bach’s poetic and musical renderings of biblical texts. What distinguishes Pelikan’s approach is his raison d’être—revealingly, he writes in the preface that his career has been motivated in part by trying to respond to the Holocaust. His latest effort, then, is as much an essay on Jewish-Christian relations as it is a simple history of an important cultural artifact. He takes great pains to show the similarities between Jewish and Christian ways of reading Scripture, to show that Jews and Christians are worshipping the same God through different canons of sacred text. He suggests, for example, that the Talmud and the New Testament can be considered “alternate” interpretations and responses to the Torah, “so near to each other and yet so far from each other.” In the seventh chapter, “The Peoples of the Book,” readers first encounter Islam. 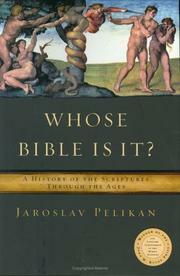 Pelikan argues that the Qur’an is both very similar to and very different from the Jewish and Christian Bibles. Though the Qur’an is not properly Pelikan’s topic, readers may nonetheless wish for more than a tantalizing four pages thereon. The whole would also have benefited from a lengthier treatment of the Bible in America—perhaps a discussion of the myriad niche Bibles available at every bookstore, or of the biblical paraphrases popular for the last 25 years. Engaging and informative for both Jews and Christians, as well as armchair scholars.